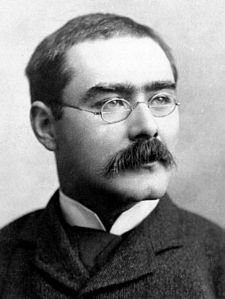 Joseph Rudyard Kipling ( 30 December 1865 – 18 January 1936) was an English journalist, short-story writer, poet, and novelist. He was born in India, a fact that inspired much of his work. Kipling’s works of fiction include The Jungle Book (1894), Kim (1901), and many short stories, including “The Man Who Would Be King” (1888). His poems include “Mandalay” (1890), “Gunga Din” (1890), “The Gods of the Copybook Headings” (1919), “The White Man’s Burden” (1899), and “If—” (1910). He is regarded as a major innovator in the art of the short story; his children’s books are classics of children’s literature, and one critic described his work as exhibiting “a versatile and luminous narrative gift”. At the beginning of the First World War, like many other writers, Kipling wrote pamphlets and poems which enthusiastically supported the UK’s war aims of restoring Belgium after that kingdom had been occupied by Germany, together with more generalised statements that Britain was standing up for the cause of good. In September 1914, Kipling was asked by the British government to write propaganda, an offer that he immediately accepted. Kipling’s pamphlets and stories were very popular with the British people during the war, with his major themes being glorifying the British military as the place for heroic men to be, German atrocities against Belgian civilians and the stories of women being brutalised by a horrific war unleashed by Germany, yet surviving and triumphing in spite of their suffering. It is speculated that these words may reveal his feelings of guilt at his role in getting John a commission in the Irish Guards.